Boyds, Md. (April 13, 2019) – The Washington Spirit kicked off the 2019 NWSL season with a strong 2-0 win against Sky Blue FC. 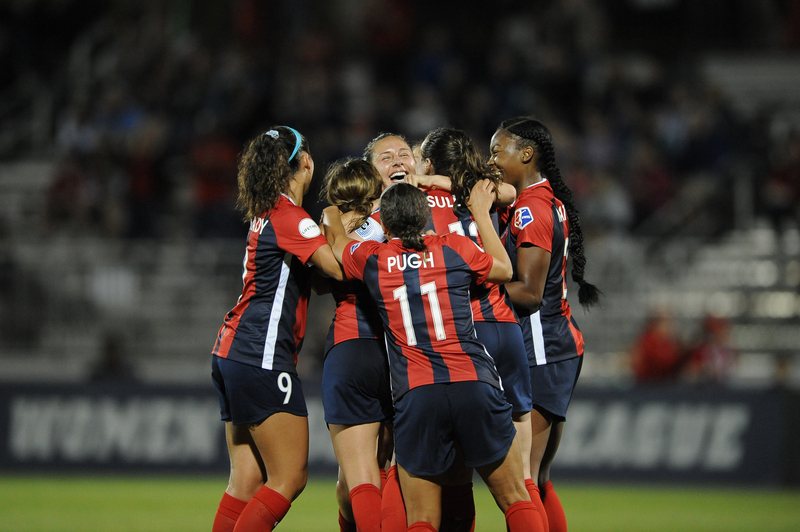 With the win, the Spirit moved to the top of the NWSL table. The Spirit nearly grabbed an early lead in the 13th minute after forward Mallory Pugh gathered the ball up-field and found Cheyna Matthews on the left side of the six-yard box. Matthews’ attempt was saved by the keeper but pushed into the path of Ashley Hatch who finished the chance, only for it to be called offside. The Spirit continued to move forward through Pugh as she cut inside from left to right at the top of the box and sent a bending ball just over the bar in the 21st minute. The ball found Pugh inside the box again one minute later and she split through two defenders after quick dribbling, but her shot was blocked. The Spirit’s best chance of the half came in the 25th minute after the ball found midfielder Meggie Dougherty Howard at the top of the box. Dougherty Howard connected cleanly with the ball on a volley, but the drive whipped just over the bar. After 45 minutes, the Spirit had a firm grip on the game. Washington boasted 62 percent possession and a passing accuracy of 85 percent to Sky Blue’s 71 percent. In addition, the Spirit outshot Sky Blue by a margin of eight to three. The backline, lead by Tori Huster, Sam Staab, Tegan McGrady and Paige Nielsen, did not allow a single shot on target during the first half. Spirit rookie defender Staab recorded the first goal of her NWSL career and gave the Spirit a 1-0 in the 59th minute after a scramble following a corner ended with the ball at Staab’s feet. Staab, from near the penalty spot, struck a low left-footed shot through a cluster of players and found the bottom right corner of the net. Sky Blue’s best chance of the game came during the 74th minute after Sky Blue midfielder Carli Lloyd connected on a header off a corner, only to be met by a fingertip save by Spirit goalkeeper Aubrey Bledsoe who pushed it over the crossbar. In stoppage time, the Spirit erased all hope of a Sky Blue comeback when Pugh found herself in a pocket of space on the right wing. Pugh was able to send a bending cross into the box and connected with the head of Megan Crosson, who drilled the header towards the keeper’s near post and into the upper-right corner of the net to make it 2-0 to the Spirit. The young Spirit defense featuring Huster, Staab, McGrady and Nielsen operated as a unit throughout the night, stymying Sky Blue attackers for the full 90 minutes. Nielsen led the team in tackles and clearances with four and seven respectively. The first-round draft picks Staab and McGrady both caused six turnovers on the night. The veteran Huster, playing right back, lead the team with four interceptions. The Spirit will travel to Rio Tinto Stadium in Sandy, Utah next week to face off against Utah Royals FC on Saturday, April 20. Kick-off is set for 9:00 p.m. ET.